Moody. Reckless. Impractical. Insecure. Distracted. These are all words commonly used to describe adolescents. But what if we recast these traits in a positive light? Teens possess insight, passion, idealism, sensitivity, and creativity in abundance—all qualities that can make a significant positive contribution to society. 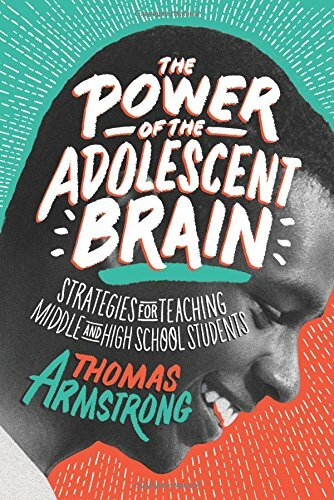 In this thought-provoking book, Thomas Armstrong looks at the power and promise of the teenage brain from an empathetic, strength-based perspective—and describes what middle and high school educators can do to make the most of their students’ potential. 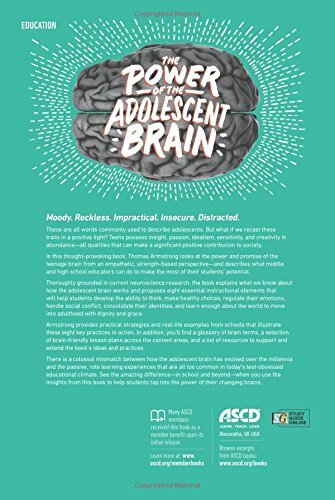 Thoroughly grounded in current neuroscience research, the book explains what we know about how the adolescent brain works and proposes eight essential instructional elements that will help students develop the ability to think, make healthy choices, regulate their emotions, handle social conflict, consolidate their identities, and learn enough about the world to move into adulthood with dignity and grace. Armstrong provides practical strategies and real-life examples from schools that illustrate these eight key practices in action. In addition, you’ll find a glossary of brain terms, a selection of brain-friendly lesson plans across the content areas, and a list of resources to support and extend the book’s ideas and practices. There is a colossal mismatch between how the adolescent brain has evolved over the millennia and the passive, rote learning experiences that are all too common in today’s test-obsessed educational climate. See the amazing difference—in school and beyond—when you use the insights from this book to help students tap into the power of their changing brains.